NEW YORK (AP) — Television’s biggest night wasn’t that big. The Emmy Awards drew a record-low audience of just over 10.2 million people, down 11 percent from the past two years. 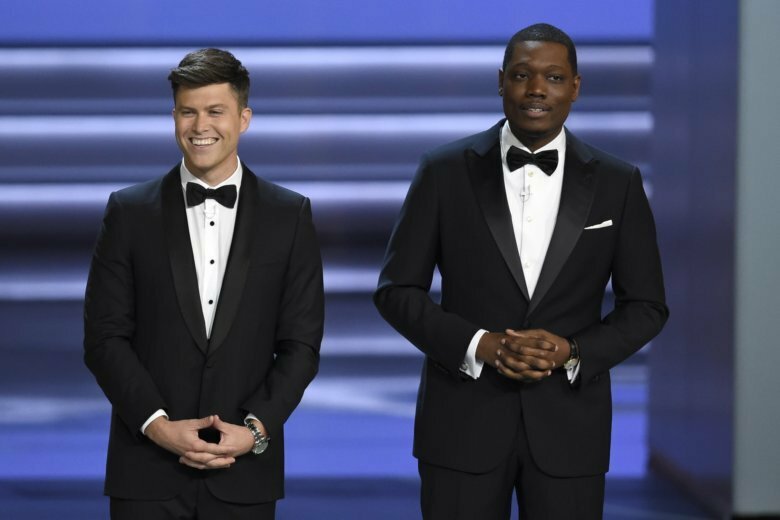 Michael Che and Colin Jost of “Saturday Night Live” hosted the awards show on NBC Monday. Amazon’s “The Marvelous Mrs. Maisel” became the first show from a streaming service to win best comedy, while HBO’s “Game of Thrones” was the top drama. The show reached virtually identical audiences of 11.4 million each of the last two years, the Nielsen company said. The decline to 10.21 million continues a troubling trend for televised awards shows. The Oscars audience this year was down 19 percent from 2017 and the Grammys were down 23 percent. The further fragmentation of television undoubtedly plays a role in audience interest levels. When “Frasier” was winning awards in the 1990s, the comedy was regularly seen in nearly 20 million homes. Streamed shows like “Mrs. Maisel” are far less popular and, in fact, it’s still difficult to get precise numbers about how many people watch them. Three times in the 1990s, the audience for the Emmy Awards exceeded 20 million people. On the bright side, it’s likely to have contained the most-watched marriage proposal of the year. Emmy winner Glenn Weiss heartened audience members by proposing to his girlfriend while onstage accepting an award for directing the Oscars telecast. Jan Svendsen said yes. Continuing the white-hot market for news, MSNBC’s Rachel Maddow recorded her highest-rated week in the show’s 10-year history, Nielsen said. Otherwise, football dominated the television ratings last week. Five of the 10 most-watched shows were football games, and two others were football pregame shows, Nielsen said. NBC won the week in prime time, averaging 6.7 million viewers last week. CBS had 4.8 million viewers, ABC had 4 million, Fox had 2.3 million, Univision had 1.4 million, ION Television had 1.33 million, Telemundo had 1.31 million and the CW had 740,000. ESPN was the week’s most popular cable network, averaging 2.65 million viewers in prime time. Fox News Channel had 2.42 million, MSNBC had 2.13 million, HGTV had 1.35 million and USA had 1.34 million. ABC’s “World News Tonight” topped the evening newscasts with an average of 8.8 million viewers. NBC’s “Nightly News” was second with 8.3 million and the “CBS Evening News” had 6 million viewers. For the week of Sept. 10-16, the top 10 shows, their networks and viewerships: NFL Football: N.Y. Giants at Dallas, NBC, 20.66 million; “NFL Pre-Game Show,” NBC, 14.22 million; “60 Minutes,” CBS, 11.44 million; “Football Night in America,” NBC, 10.89 million; “America’s Got Talent” (Tuesday), NBC, 10.75 million; NFL Football: N.Y. Jets at Detroit, ESPN, 10.5 million; “America’s Got Talent” (Wednesday) NBC, 10.15 million; NFL Football: L.A. Rams at Oakland, ESPN, 9.78 million; College Football: Ohio St. at TCU, ABC, 7.23 million; NFL Football: Cincinnati at Baltimore, NFLN, 7.06 million.